Ray Cooney’s comedies offer few big surprises. 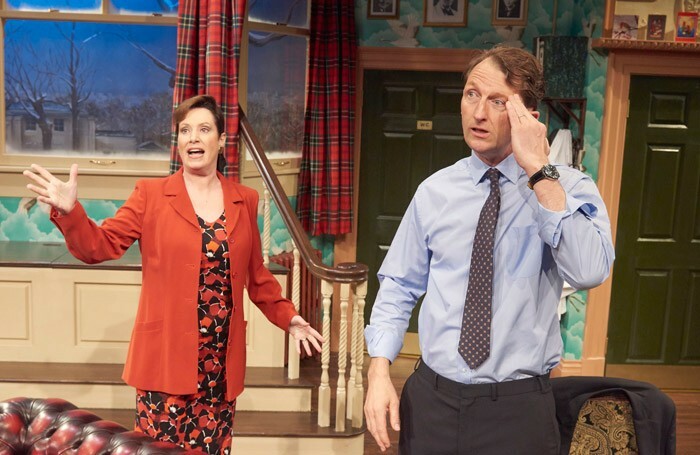 The audience knows to expect a manic farce with mistaken identities and a series of frenzied entrances and exits coupled with increasingly improbable situations. But crass as it can sometimes be, farce is an art-form and the team at the Mill at Sonning, as proven in the past, knows how to carry it off. Set in a hospital, Cooney’s early 1990s play It Runs in the Family is full of exaggerated plot convolutions as various members of the medical profession tell lie upon lie to cover their own reputations. The cast of Ron Aldridge’s production work incredibly hard. Nick Wilton, as Dr Hubert Bonney, is a delightfully eccentric stooge to Harry Gostelow’s “pillar of the community” Dr Mortimore, the leading physician. Brian Hewlett has an entertaining cameo part as Bill, the elderly patient who unwittingly gets caught up in things, and there are credible performances from Jonathan Niton as the Police Sergeant and Sam Ruane as Mortimore’s long-lost son Leslie, who both provide an earnest and calmer counterbalance to the mania around them. Sarah Ogley is superb as the former nurse who delivers the news to Mortimore that he fathered her son 18 years ago. There is also some great supporting work from the rest of the cast, playing a myriad of characters and all contributing to the pace of the piece and the building up of laughs.